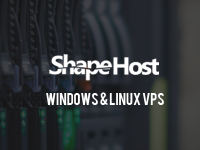 ShapeHost is giving away 30% OFF on their VPS Rectangle Plan, instead of $123, you’ll only pay $107 for life! No price updates, no changes at all. This is huge if you wanted a powerful VPS Server, make sure you use the ShapeHost coupon to apply the discount.